In the 40 years since Evergreen opened, the world of cartooning and animation has been turned on its ear. Newspaper comic sections have shrunk dramatically; the market for alternative-minded artists has gone through a boom-and-bust cycle; and animation has morphed into an anything-goes medium with something to offer for all. Evergreen was there at the dawn of this transformation. Lynda Barry ’79 sprang fully formed onto the alternate weekly scene, becoming a recurring guest on David Letterman and channeling her idiosyncratic voice into her comics, novels, a play and teaching. Matt Groening ’77 made the leap from the pages of those same weeklies to create “The Simpsons,” the signature show for the upstart Fox network. Five hundred episodes (and counting) and a star on the Hollywood Walk of Fame later, he rewrote the rules for TV animation, paving the way for the likes of “South Park,” “Family Guy,” and the alt-cartoon universe of shows populating Cartoon Network’s Adult Swim. Craig Bartlett ’81 honed his chops making cartoons from clay, contributing his talents to the iconic “Pee-Wee’s Playhouse” and “Rugrats” series before creating his own pair of kids’ shows, “Hey Arnold!” (for the 6- to 10-year-old Nickelodeon-watching crowd) and “Dinosaur Train” (for 2- to 6-year-old PBS viewers). And Tommy Thompson ’11? He’s the new kid on the block, and he represents the next generation of Evergreen animators. He’s still finding his voice—imagine Tim Burton as an introvert—but he’s poised to build on the talents that made him Most Promising Filmmaker at the Spokane International Film Festival in January. If you were to draw a genealogy of Barry’s bibliography—her breakthrough strip “Ernie Pook’s Comeek” (created in 1978), her novel (and later play) The Good Times Are Killing Me (1988), and the writing and art tutorials What It Is (2008) and Picture This: The Near-Sighted Monkey Book (2010)— you can trace it all back to Evergreen, and her mentor, Marilyn Frasca. Lynda Barry and Matt Groening. Frasca, who still teaches the occasional class as an emerita professor, joined the Evergreen faculty in 1973, a year before Barry chose Evergreen with the aid of “a really smart English teacher at my high school.” Barry studied the History of the Renaissance and Middle Ages her first year, and the History of Science her second year. “Then my third and fourth year I worked with Marilyn Frasca in one way or another,” she recalls. All sorts of people are making comics now and, more importantly, all sorts of people are reading them. Twenty-three seasons and 27 Emmy Awards later, “The Simpsons” is an inextricable part of pop culture. In addition to the Springfield ensemble, Groening continues work on five-time Emmy-winner “Futurama,” his pastiche of science fiction, which ran on Fox from 1999-2003, then got a second life when Comedy Central began airing new episodes in 2010. As demands on his time keep growing, he has mused about ending Life in Hell, but for now, Binky lives. After more than 500 episodes, Hollywood showed Matt Groening some love on February 14, 2012, when he was honored with a star on the Hollywood Walk Of Fame. After asking around, Bartlett learned that Evergreen had an animation studio and better still, “no rules, no grades.” He transferred in as a senior, and learned the basics of the craft from Roger Kukes, an award-winning animator and visual artist. Each quarter he made an animated short (“they were all terrible, two-minute things”) and he became art director for the CPJ, publishing many of the comic strips he had drawn the previous summer. 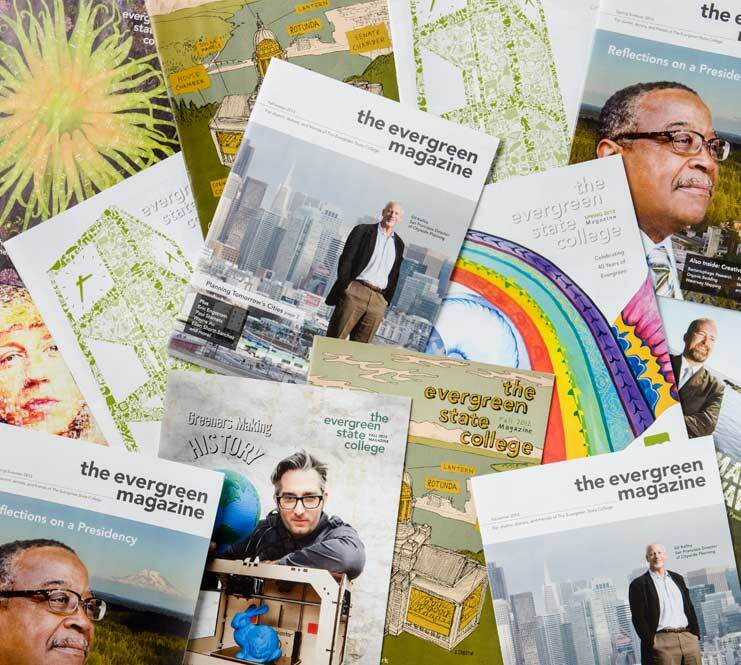 “I had a dream fourth year at Evergreen,” he says. What has four arms, two legs, and a penchant for chess and black hoodies? If you answered Elliott, the protagonist in Tommy Thompson’s award-winning short ‘‘High Strung,’’ step to the head of the class. Thompson could have used those extra hands himself in making the 13-minute stop-motion animated short, while shooting digital still after still in his most fully realized film to date. Tommy Thompson’s 13-minute stop-motion animation ”High Strung” has made waves at several film festivals, including the 2012 Spokane International Film Festival, where Thompson was named Most Promising Filmmaker. Thompson was a working filmmaker before he even started ninth grade. At age 13, borrowing his parents’ Hi8 camera, he made a 45-minute skateboarding video, which he sold at the local skate shop. (He earned back about half of his $300 investment, but the video got him a lot of exposure.) While in high school, he did his first animation project using Legos. You have to build a following. I kind of have trouble publicizing myself—it’s always been a little weird for me.